Sometimes the difference between being dressed and well dressed is just adding a stylish blazer or dinner jacket to what you're already wearing. 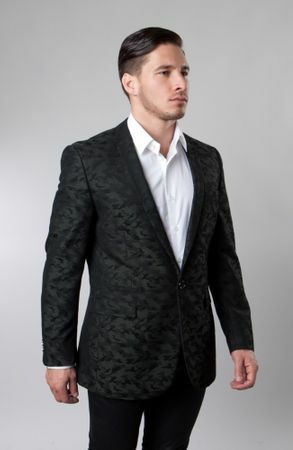 You will be able to make yourself look great just by putting on a dinner jacket by Tazio. These jackets aren't just for dinner but for owning the night. This dark green patterned jacket has double vents in the back and comes as a modern fit. Made of woven poly microfiber.